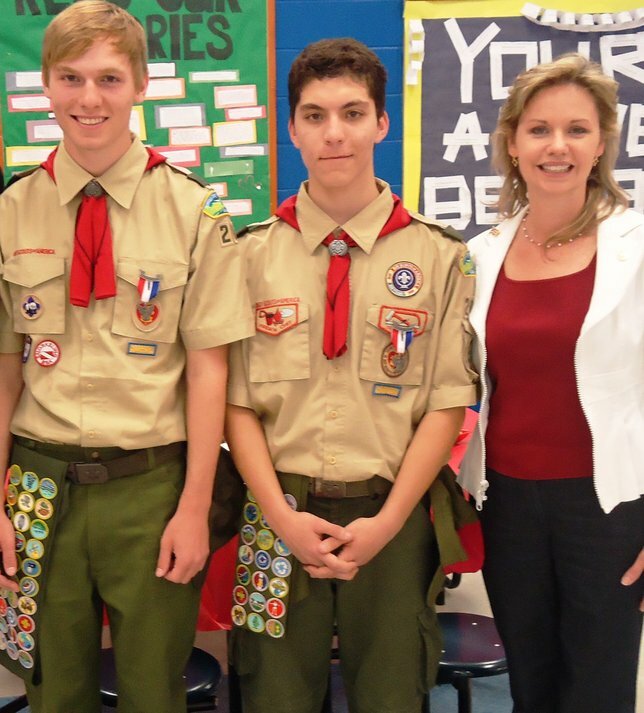 Miller Place, NY, May 2013 – Suffolk County Legislator Sarah Anker recognized Eagle Scout recipients Alexander Abrams and Kevin Anderson on Saturday, May 18th at the Miller Place High School. Both boys are members of Miller Place’s Boy Scout Troop 204. In order to obtain their Eagle Scout merits, Alexander and Kevin were required to complete a project. Alexander chose to oversee the restoration of educational kiosks in the Pine Barrens, removing graffiti from the displays, replacing their broken fiberglass, and cleaning litter from the surrounding area. Kevin constructed a portable cabinet for the Port Jefferson High School’s drama department. The rolling cart will be used to transport props used by theater students. Subject: LongIsland.com - Your Name sent you Article details of "Legislator Anker Recognizes Miller Place Eagle Scouts"